Summary: Successful incubation of sea turtle eggs only occurs within a narrow thermal range; when nest temperatures reach the upper thermal threshold eggs may not develop and die. Considering this and projected increases in temperature it is crucial to understand how hatchling output might be affected by changes in climate. Therefore, the overall aim of this project is to explore the potential impacts of climate change on loggerhead hatchling output. For this we will focus on the Northern Gulf of Mexico (NGM) Recovery Unit and: 1) determine the effects of local environmental variables, the incubating environment, and nest location on hatchling output for the NGM loggerhead Recovery Unit; and 2) project how predicted changes in these variables will affect future hatchling output. To address these objectives we will conduct fieldwork at St. George and St. Joseph State Parks and collect information on the incubating environment and local climate for each location as well as hatchling output data. Models will be developed to explore the variables that best describe hatchling output and to project future hatchling output under various scenarios. Results: Completed deploying Ibuttons at St. Joseph Peninsula and St. George Island State Parks during the 2017 nesting season. Ibuttons were deployed in 23 nests at St. George Island State Park and 28 nests at St. Joseph Peninsula State Park. There was high depredation by coyotes at St. Joseph Peninsula State Park caused Ibuttons to be removed from 16 nests (57%) of the 28 nests monitored. Seven nests (25%) washed away at St. Joseph Peninsula State Park prior to inventory with the Ibutton due to adverse weather conditions. Two Ibuttons at St. Joseph Peninsula State Park and three Ibuttons at St. George Island State Park did not display data after being retrieved. 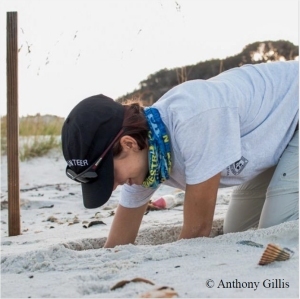 At each park we deployed Ibuttons at 21% of loggerhead nests laid in the 2017 nesting season. However, at St. Joseph Peninsula State Park, because of inundation, depredation and technical difficulties, only 3 Ibuttons contained data that could be used. Generalized Linear Mixed-Effects Models with year as the random effect and the binomial family specified were used to analyze the influences of local climate and incubation temperatures on hatchling output at St. George Island. Corrected Akaike Information Criterion (AICc) were used to determine the best model describing hatchling output. Best fit models describing hatchling output at St. George Island State Park. The model with the lowest AICc value and high significance describing hatching success was the average incubation temperature during the final third of incubation. The model with the lowest AICc value and high significance describing emergence rate was the average incubation temperature during the second third of incubation.